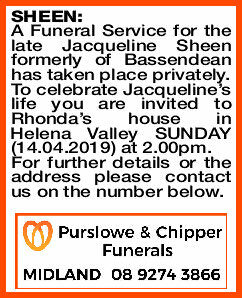 A Funeral Service for the late Jacqueline Sheen formerly of Bassendean has taken place privately. To celebrate Jacqueline's life you are invited to Rhonda's house in Helena Valley SUNDAY (14.04.2019) at 2.00pm. For further details or the address please contact us on the number below.